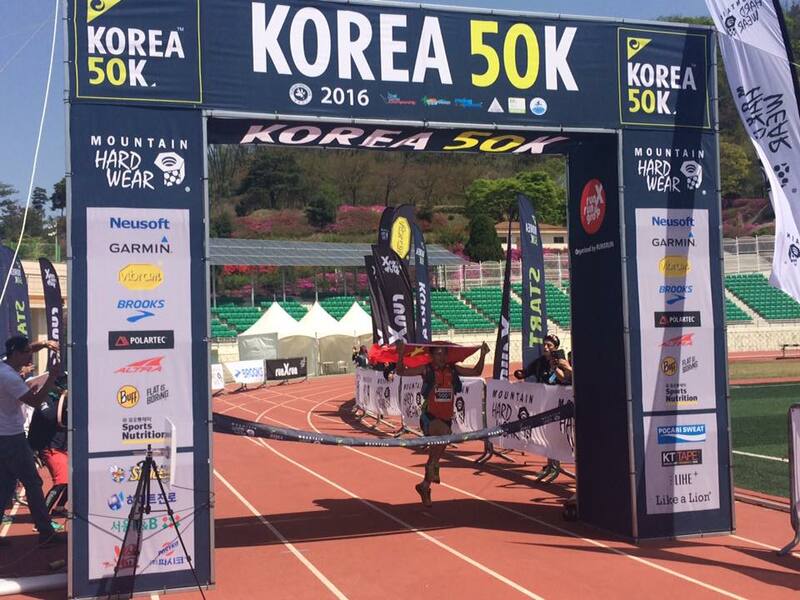 The organisers of Korea 50K have opened the books for the 3rd edition of their event, scheduled for 23 April 2017. Given its host venue Dongducheon is right next to capital city Seoul, Korea 50K offers a great weekend getaway for the whole family. While the main race is a rather tough 59 kilometre rollercoaster that has a total elevation gain of 3500 hm, beginning runners can also opt for a short and quite flat 10 km run. The 59K race will take place throughout the Sunday and starts at 5 am with finish at 6.30 pm. The trail course has actually been made even a bit harder than this year's and now measures 3500 hm. That makes Korea 50K a relatively short race for good climbers. Last April, two international runners actually took the victory in the male and female categories. China's Xu Xiutao was a proud winner, in what for the young Beijinger was certainly a breakthrough moment. Yukari Fukuda from Japan was the fastest woman. As South Korean trail running has been developing quickly, we can expect the locals to be more than ready to score a win for the host country in 2017. You can now register for the Korea 50K via the local event website already. A concise overview of the key event details are available also here on our cover page. This weekend there are two points races on the Asia Trail Master schedule: Ultra Trail Jeju in South Korea, and Mount Falaza Ultra Trail in Eastern Russia. Both races are young and keen to develop further into important races on the Asian trail calendar. UT Jeju is a three-day stage race of 100 km in total, while Mt Falaza UT features a 50 km and 39 km race valid for Asia Trail Master points on and around the Falaza mountain that characterises the Promorye region in the very far East of Russia, close to Vladivostok. This Friday, approx 110 runners will begin the stage race on the beautiful Jeju Island that belongs to South Korea. On day 1, they are supposed to climb the highest peak of the island, Mt Halla, in a race of 30 km. Day 2 and 3 consist of 36k and 34k respectively. Two weeks ago, harsh weather conditions forced the organisers of Ultra Trail Mount Jiri to reduce their event to 50k, but this weekend should not be that dramatic. Mount Falaza Ultra Trail is hosted by the Gribanovka Ski Resort, a popular place for skiing in winter and now also increasingly so for trail running and adventure racing. While still a boutique event this year, the local organiser is a well-known and respected athlete in the North Asia region himself, who is highly motivated to develop the event in the years to come. Trail running is also in eastern Russia still a very young sport. Participants can combine the race with a city visit to Vladivostok, as shuttle bus transport to and from the Gribanovka Ski Resort is arranged by the race organiser. As always, via our social media channels you can stay tuned to the action on the scene! This weekend the second Korean trail race of the Asia Trail Master season is on the menu. A tough mountainous race in the country's Southern region, on and around the holy Jirisan mountain. Mount Jiri is in fact the second highest mountain in Korea at 1915m above sea level, and the surrounding national park the largest of its kind. Trail runners have 100km or 50km to absorb this weekend. The main race has approx 5900m of elevation gain and a tight cut-off time of 32 hours. Spectactular views and local ethnic culture will accompany the athletes during their effort. The event will have its second edition following a successful test race last year. Organised by the same crew of Korea 50k - the country's best known trail race and also an Asia Trail Master points race in April - UTMJ has the environment to develop further into a classic race on the Asian calendar. Accessible via Busan, the organisers also arrange transport from Seoul and the main event hotel is the great Kensington resort. The competition is quite open with a great mix of local Korean athletes and international runners. The conditions during the race may affect performances, so it really remains to be seen who will emerge victorious. You can follow the action at UTMJ live via our social media channels this weekend. The second race in South Korea that qualifies for points in this year's Asia Trail Master series takes place on "holy" ground: Jirisan, or Mount Jiri, is one of the country's marquee mountains. The race, in its second edition, goes over the traditional ultra distances of 100km or 50km and seems suited for solid climbers. An elevation gain of nearly 6000 hm is substantial. The organisers had to wait quite some time for the necessary permits, but now the stage is set for another great event in Korea, where trail running is rapidly gaining popularity. The event takes place on 1/2 October and registration via the event website is already open. Jirisan is of course the central part of the Jirisan National Park, the oldest in Korea and one that places emphasis on biodiversity conservation. The highest peak is over 1900m above sea level. The closest major airport to Jirisan is Busan, but the organisers are also arranging a bus service from Seoul station to the event, and in particular to the Kensington Resort, which functions as the event centre. Find out more logistical info here, or on the event website itself. It is important to book the bus from Seoul station and return in advance! Event centre is the Kensington Resort where you can arrange comfortable accommodation for the race weekend. Important is to book through the event organisers, as described on our cover page.